Aug. 4, 2010 – Some growing seasons bring the optimism of a new year, with the potential for high yields, low disease or pest problems and rising commodity prices. height of 4 to 5 feet. Then reality tends to set in. In the Mid-South region of the US, growers in Tennessee, Arkansas, Mississippi and Missouri recently have come to the realization that resistance to herbicides, specifically glyphosate, is a problem across that district, and if they are to deal with it effectively, the time to act is now. Herbicide resistance is a growing problem across all agricultural regions of North America. In Western Canada, kochia has been resistant to ALS inhibitors since the late-1980s. In Ontario, there are now eight different weed species that are resistant to various modes of action. And Tennessee saw the first incidents of glyphosate-resistant Canada fleabane (known as marestail in the US) in 2000, and that trend has since spread into Indiana, Ohio and points further north. But it is in the Mid-South region which has become a hallmark of sorts. In that part of the US, the three primary crops are soybeans, rice and cotton, and almost all of the varieties of soybeans and cotton grown in that region are glyphosate-tolerant (Roundup Ready). 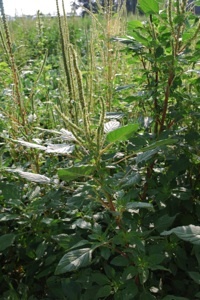 The resulting reliance on that technology has given root to a biotype of Palmer amaranth or Palmer pigweed that is now resistant to glyphosate. Reliance on Roundup Ready technology has grown to the point where no amount of glyphosate is sufficient to kill various weeds. That leaves growers to rely on frequent spray applications with other, less-effective formulations, as well as manual labor to physically remove the plants. The last thing that organizers and speakers wanted to do was to criticize or blame anyone for the on-set of resistance to glyphosate. The active ingredient has been hailed as a “one in 100-year event” by many, and is still held in high regard by most. 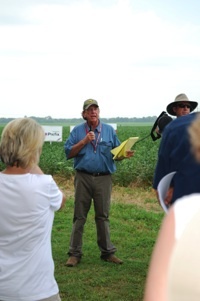 Yet the field tour offered a blend of cautionary tales of what can happen with the extent of glyphosate resistance that has spread across the region, together with a sense of optimism that acknowledges the problem of weed resistance as a first-step towards dealing with the issue. According to several presenters, including Ford Baldwin, formerly with the Arkansas Extension Service and Dr. Jason Norsworthy of the University of Arkansas, this level of resistance did not exist in 2008; it has literally exploded on the scene. And Sid Fogg, the grower who hosted the morning field tour, spent $250 per acre to kill weeds in 2009. As with any weed, the key to stopping Palmer pigweed is to prevent it from setting seed. However, according to Norsworthy, that is one of the biggest problems associated with Palmer pigweed in the Mid-South region. The weed is dioecious, meaning it has distinct male and female parts, with the females capable of producing up to half a million seeds. And in the Mid-South region, seed dispersion can occur through residue management, via mechanical means or as a result of flooding of the nearby Mississippi and its many tributaries, streams and irrigation channels. At one point, Dr. Steven Powles, director of the Herbicide Resistance Initiative at the University of Western Australia, and considered one of the foremost authorities on the subject, asked what more can be done to ensure growers are not standing in the same field five years from now, talking about glufosinate resistance. The response was a multi-faceted approach, including rotation of herbicides as well as rotating crop modes of action (genetically modified versus non-GM varieties), growers knowing the weed species in their own fields, correct application of herbicides and encouraging rapid canopy development. One other recommendation: do not overlook “the power of iron”; tillage is always a viable option in dealing with weeds. On the optimistic side, Powles pointed at growers in Western Canada, noting that their options are better suited to controlling weed resistance. The inclusion of wheat, which is not genetically modified at the present time, in rotation with canola, which has three different modes of action available, means growers are not seeing resistance to glyphosate in canola. “Glyphosate is only part of a system,” he said. “There are crops with other herbicides, so the Canadian farmer, and those that advise them can give themselves a pat on the back.